Did you know that the first hybrid in the world was developed by Porsche almost 110 years ago.Well I never knew that before. Now following Ferrari hybrids unveil News, Porsche too is going to unveil its new hybrid at the Geneva Motor show in march. 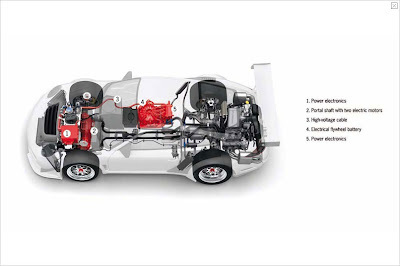 Unlike a normal hybrid which uses heavy batteries the Porsche Hybrid uses a flywheel technology which was developed by Williams F1 called Kinetic Energy Recovery System (KERS). In this Technology the fly wheel rotates at high RPM thus storing energy. This technology is quite innovative a may find a lot of application in the future hybrid cars. The Porsche Sports a powerful 480 BHP, 4 Litre, Flat Six Engine in the Rear PLUS,powerful 60kW electric motors(two) in the front axle. These two electric motors are connected to a motor/generator attached with a flywheel (Its actually a complete unit) .When brakes are applied the two motors in the front axle act as generators which power the flywheel attached motor. The flywheel spins at ultra high 40000RPM and stores mechanical energy in the form of Rotation. Now when the driver accelerates,the fly wheel motor acts as a generator and supplies power of upto 120 kW to the front axle motors providing a thrust of power to the car which will slow the flywheel electromagnetically.The power burst will be available to the driver for 6-8 sec before another charging cycle. This will make the car consume lesser fuel thus making it more efficient and producing lower carbon emissions. From the Racing point of view its lower fuel consumption means lesser pit-stops. After the cars unveil at the Geneva. It will make its racing debut at the 24 Hours Race at the Nordschleife of Nürburgring on May 15th and 16th. 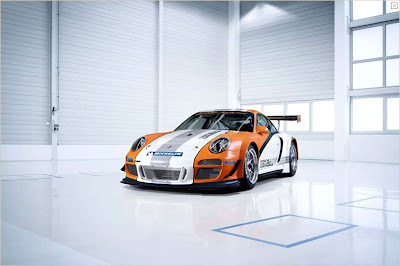 Porsche says that the focus here is not on winning the race but rather serving as a spearhead in technology and a “racing laboratory” providing a platform for subsequent use of hybrid technology in road-going sports cars. Considering the additional weight of the motor and flywheel its obvious that the car may not win races, But the technology will definitely prove a great boon!